Aly Raisman of Needham finished her routine on the vault in the Artistic Gymnastics Women's Individual All-Around final. Aly Raisman competed on the balance beam. South Korea's Cha Se-na passed to a teammate during the women's hockey preliminary match against Japan. Hungary's Gabor Csaszar took a shot against Croatia's Drago Vukovic, left, and Ivan Cupic in their men's handball Preliminaries Group B match. Marie-Andree Lessard of Canada went for a dig during a beach volleyball match against Italy. Montenegro's Vjekoslav Paskovic controlled the ball during their men's preliminary round Group B water polo match against Serbia. 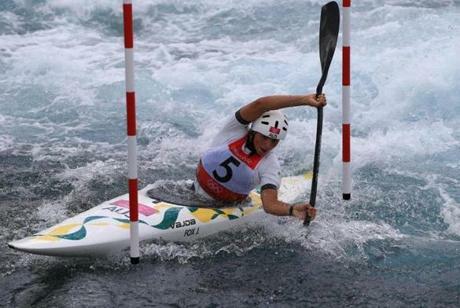 Jessica Fox of Australia competed in the women's kayak single (K1) slalom. Rebecca Soni of the United States competes in the Women's 200m Breaststroke Final. 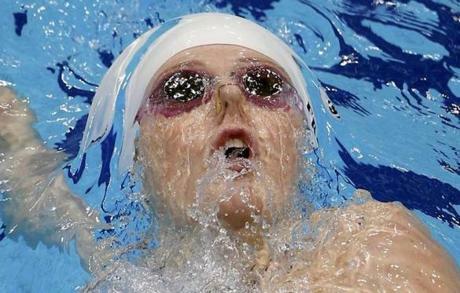 Missy Franklin of the United States swam in her women's 200-meter backstroke heat. Britain's Rebecca Adlington started in a women's 800-meter freestyle swimming heat. Michael Phelps swam to a first place finish in heat 6 of the men's 100-meter butterfly event. 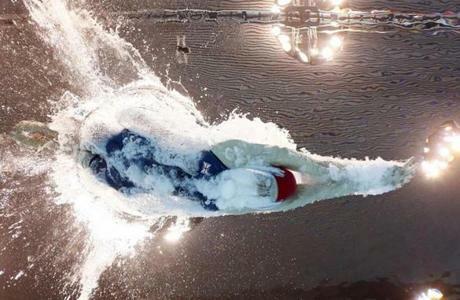 Phelps also won gold in the 200-meter individual medley. 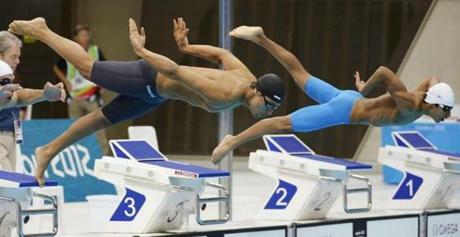 Sofyan El-Gadi of Libya, left, and Bahrain's Khalid Alibaba started in a men's 100-meter butterfly swimming heat. 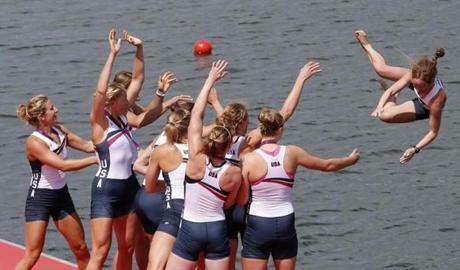 Team USA celebrated winning the gold medal at the victory ceremony after the women's eight finals rowing event. The team included Erin Cafaro, Zsuzsanna Francia, Esther Lofgren, Taylor Ritzel, Meghan Musnicki, Eleanor Logan, Caroline Lind, Caryn Davies, and Mary Whipple. Rebecca Soni of the United States celebrates after setting a new world record time of 2:19.59 in the Women's 200m Breaststroke Final. 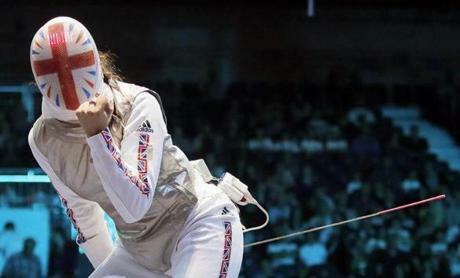 Britain's Sophie Troianol compete in a round of 16 match against Egypt at women's team foil fencing. Czech Republic's Lukas Krpalek celebrated after defeating Japan's Takamasa Anai (white) in their men's -100kg elimination round of 16 judo match. Lee Kiefer of the United States and South Korea's Hyun Hee Nam, right, saluted at the start of their women's foil team quarterfinals fencing match. 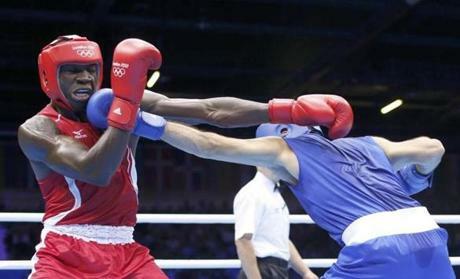 Namibia's Mujandae Kasuto fights against Hungary's Zoltan Harcsa, right, in their men's middle (75kg) round of 16 boxing match. Fernando San Emeterio #11 of Spain lost control of the ball against Luol Deng #9 of Great Britain in the first half during the men's basketball preliminary round match. 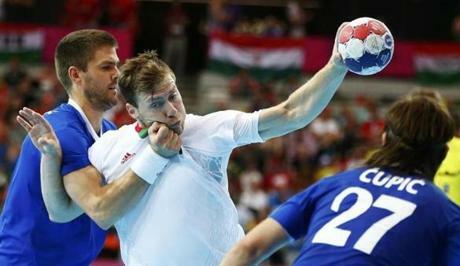 Hungary's Gabor Csaszar took a shot challenged by Croatia's Drago Vukovic, left, in the men's handball Preliminaries Group B match. 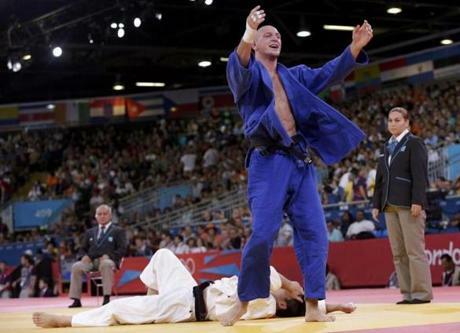 Henk Grol of the Netherlands competed against Dimitri Peters of Germany (in blue) during the men's 100-kg judo competition. 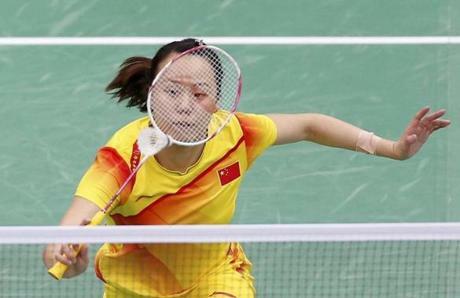 China's Zhao Yunlei played against Indonesia's Mohammad Ahsan and Bona Septano during their mixed doubles badminton semifinals match. Carlotta Ferlito of Italy competed on the balance beam in the Artistic Gymnastics Women's Individual All-Around final. Gabrielle Douglas of the United States competed on the vault. Douglas won the gold in the women's gymnastics all-around competition. Needham's AlyRaisman competed on the vault. 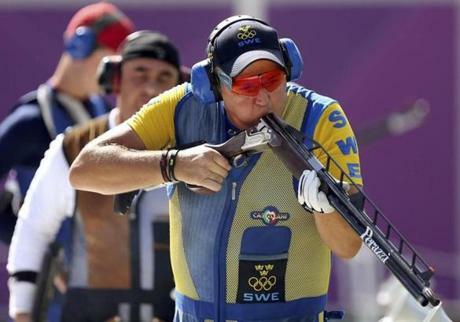 Sweden's Hakan Dahlby blew into his shotgun during the men's double trap shooting finals. 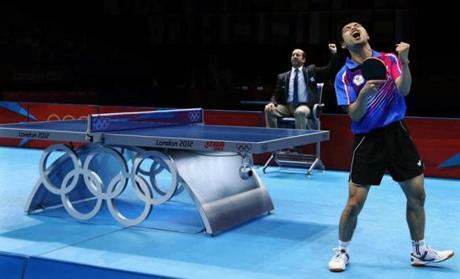 Chuang Chih-yuan of Taiwan reacted against Dimitrij Ovtcharov of Germany during the bronze medal match at men's singles table tennis. 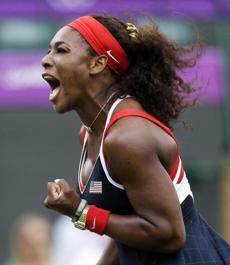 Serena Williams of the United States celebrated after breaking the serve of Caroline Wozniacki of Denmark. Kayla Harrison of the United States celebrated after winning her match against Gemma Gibbons of Great Britain for the gold medal during the women's 78-kg judo competition. 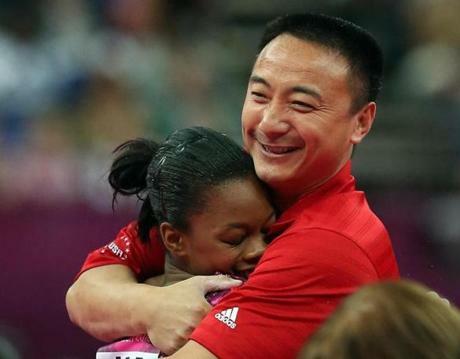 Gabrielle Douglas of the United States hugged coach Liang Chow after her uneven bars routine.